Opens: I was running today. I couldn’t look back; it would only make me weak. Tears of shame rolled out of my eyes. Blurb: Shabana and Ted meet in India: Shabana is a maid in the foreign office, while Ted is a young diplomat from Melbourne. The two form an unconventional relationship that grows into love under the shadow of Urdu poetry and Western literature. They find themselves caught in a web of family secrets and betrayal, all to be re-introduced forty years later when we meet Rosemary. My thoughts: There is a lot of information about packed into this novella. The story starts against the background of the most controversial period of independent India’s history – simply named the Emergency. This is when the, on the advice of the then Prime Minister Indira Gandhi, declared a state of emergency under Article 352 of the Constitution of India, effectively bestowing on her the power to rule by decree, suspending elections other civil liberties. I confess that I was not aware of all of this – I was in my final year at High School in Australia and my focus, ashamedly, was on passing my exams rather than the upheavals in other countries. I was aware of the assassination of Indira in the 1980s – but to be honest I always thought of her as a well-loved leader – not this person who introduced some terrible laws. But I digress. This political upheaval is only the background of the story – although every so often there was a fair bit of info-bombing about the politics when the author, Melbourne based Nandita Chakraborty, explained why things were the way they were in Shabana and Ted’s story. The story jumps about in time a bit as well. We start with Rosemary in Melbourne – then jump back to Rosemary’s life in an Indian orphanage, just awful, then jump back further to 1975 and the meeting of Ted and Shabana before returning to the present. Starting in the orphanage, we read how Rosemary was found abandoned on the doorstep of the orphanage and for her first 12 years is treated as money-spinning ‘sideshow’ due to the fact she is blue-eyed and fair skinned. She is quite cruelly treated by the Matron/owner. Rosemary is eventually adopted by a rich white woman from Australia and as she goes off with her new mother, the story switches to Ted Smith and Shabana. Shabana is Muslim, promised in marriage to a much older man and works as a maid in the Australian Embassy. Ted treats her kindly and eventually love grows between them. A forbidden love due to their mixed race and different religions. Their respective parents step in to end the liaison and that is the end of that. Or is it? The couple are betrayed but there are secrets piled upon secrets and it is not until the very end that all of the secrets are unravelled at a death bed confession. 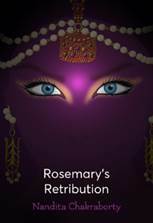 At less than 200 pages ROSEMARY’S RETRIBUTION is a quick and very interesting read. The author, who was born in India in 1975 when the Emergency was declared, certainly knows her history. And despite, as I mentioned earlier, her tendency to info bomb the information she gives is very easy to understand and explains events very clearly. I really connected to Shabana, she was a wonderful character, not so much to ted – he really came over as an innocent. However, he was young and growing into his character. He had a very strong family behind him – with expectations that brooked no dissention. Going to India was his first step to independence, but his family machinations even reached him there. I would certainly recommend ROSEMARY’S RETRIBUTION and would not hesitate to read more work by Nandita Chakraborty. With thanks to Aisling Gilhooly from Aisling Enterprises and the author my copy to read and review.